Defender Jonny Evans is a doubt for Northern Ireland's final two Euro 2016 qualifiers after injuring a hamstring. The 27-year-old centre-back hobbled off 24 minutes into West Brom's Premier League defeat by Crystal Palace. Northern Ireland face Greece at Windsor Park on Thursday, then play Finland in Helsinki three days later. "Fingers crossed he will be OK. If he is anywhere near fit we will give him a chance to play," said West Bromwich Albion manager Tony Pulis. Pulis added that fellow Northern Ireland defender Gareth McAuley "played through the pain" with a calf injury. 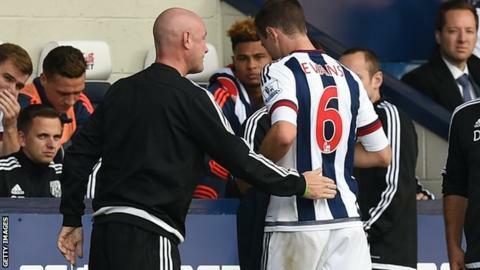 Evans and McAuley are set to have scans on Sunday. Northern Ireland are top of Group F and need two points to qualify for next summer's European Championship. Northern Ireland midfielder Chris Brunt took a blow to the face in the first half of the match at Selhurst Park, but returned to the pitch and is expected to be fit.